Waipawa is the second-largest town in Central Hawke's Bay in the east of the North Island of New Zealand. It has a population of 2,160 (June 2018). At the 2013 census, it had a population of 1,965, a change of 2.2 percent from the 2006 census. The town is located 7 kilometres (4.3 mi) northeast of Waipukurau and 46 km (29 mi) southwest of Hastings, on the northern bank of the Waipawa River, a tributary of the Tukituki River. Waipawa was settled in the early 1860s, and the Settler's Museum exhibits many of these historical collections. It holds the main office of the Central Hawke's Bay District Council, and is New Zealand's oldest inland European settlement. Waipawa has two marae affiliated with the iwi of Ngāti Kahungunu. The Mataweka Marae and Nohomaiterangi meeting house are affiliated with the hapū of Ngāi Toroiwaho and Ngāti Whatuiāpiti. The Tapairu Marae and Te Rangitahi or Te Whaea o te Katoa meeting house are affiliated with the hapū of Ngāti Mārau o Kahungunu. Waipawa has one primary school, Waipawa Primary School, and used to have a secondary school, Waipawa District High School. This was merged 75 years ago with Waipukurau District High School to make Central Hawke's Bay College based in Waipukurau. Waipawa has been home to several youth organisations. Namely, the New Zealand Cadet Forces's ATC branch, as well as a Scouts New Zealand branch. However, since 2000, both major youth organisations have gone into recess. ^ "Statistics New Zealand: 2013 Census About a place: Waipawa". ^ Roger Smith, GeographX (2005). 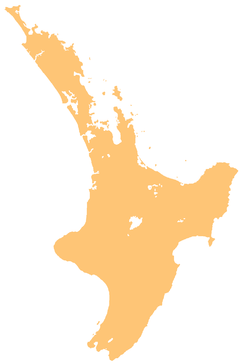 The Geographic Atlas of New Zealand. Robbie Burton. map 108. ISBN 1-877333-20-4. ^ a b "Waipawa Travel Guide". Jasons Travel Media. ^ "Discover Waipawa: Central Hawkes Bay - Unwind Country". Archived from the original on 14 May 2010. This Hawke's Bay Region geography article is a stub. You can help Wikipedia by expanding it.